Manages to draw its window only once before this happens. Description: Screenshot of Access Violation in QD. cannot reproduce this bug. what system version you use? 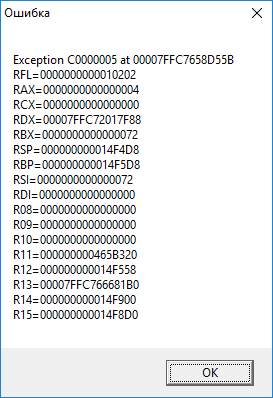 whether you could check where exactly this bug is appearing using x96dbg debugger (the last correct address)? what instruction and register causes exception? try to delete the qd.hgl file and then to run a program. 2) Don’t have it right now, otherwise I’d probably give more insight on possible reasons. Will download it or something similar in the morning. At least, AFAICT, has nothing to do with file system paths (tried both long and short ones including different volumes). 3) qd.hgl deletion didn’t help. The alignment of the beginning of a structure or a union is the maximum alignment of any individual member. For WIN32_FIND_DATA this alignment is at least 4 while the program passes unaligned pointer. From my experience, this can be the case. it for me looks like the unaligned address of the stack. thanks for the help. I don’t think 0x4A30CD is a stack address. It is somewhere in the data section. Both addresses are moved to registers as constants so it shouldn’t be a stack address. Don’t know why the function uses globally defined structure for its local task but it seems the problem is with this structure alignment which is easier to find and fix than looking through the whole program for stack misalignments. Naive question (since I don't fully understand SIMD), why not just use "movups" instead? The instruction is part of a function within a system DLL. 64-bit Windows conventions are written in a way that lets Microsoft rely on proper data alignment. It sometimes shines through to the 32-bit applications though: I once had a problem with 32-bit application using DirectShow which passed some pointer to a component that required 64-bit-convention alignment. It's possible to patch a single byte at $4078AC from $10 to $18, aligning the stack. The routine finishes with LEAVE instruction, so no change needed there. I recommend use of the ENTER instruction, as it's processor mode agnostic and only four bytes. Compared to PUSH/MOV/SUB which is six bytes. 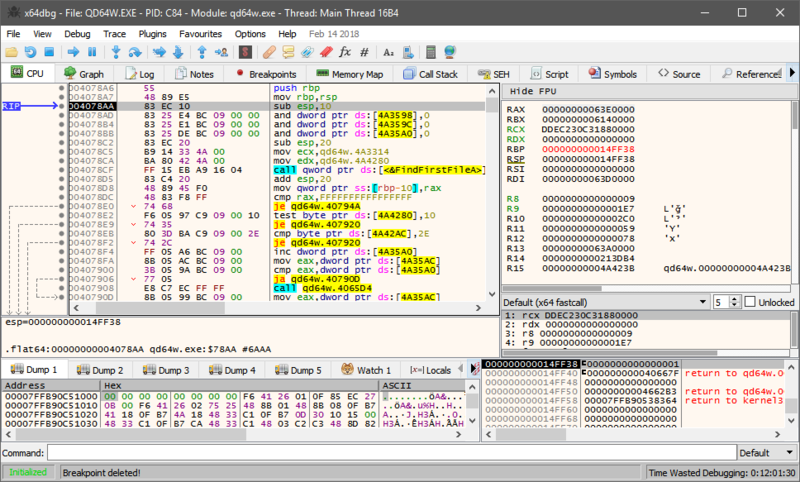 The code used is conflicted as it MOV 64-bit and then SUB 32-bit (trashing the upper dword). It works but the MOV may as well be 32-bit. Excellent IDE work CandyMan. May i suggest a feature: to search directory by just typing its first letter, you know like in Windows explorer. any idea how to compile as a .cmd for the bdos file system?